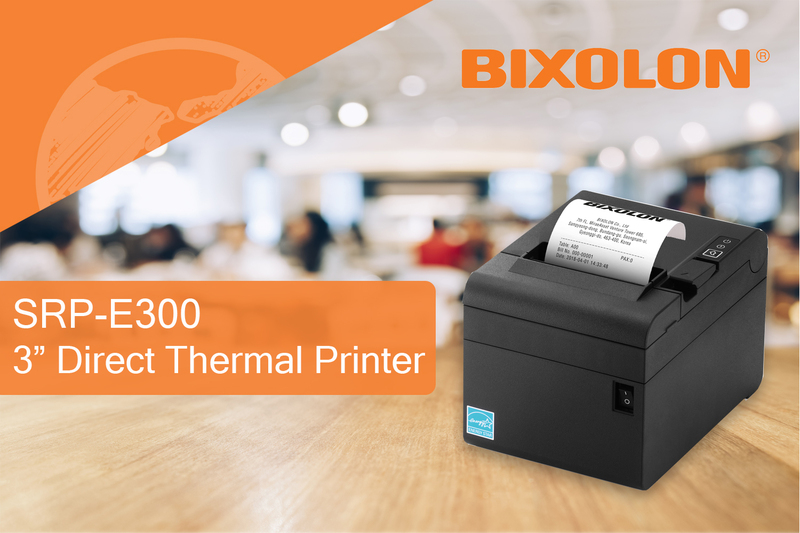 BIXOLON Europe GmbH, a subsidiary of BIXOLON Co. Ltd, a leading global Mobile, Label and POS printer manufacturer today announced the launch of the new SRP-E300 durable, yet cost-efficient 3-inch (80mm) Direct Thermal POS printer exclusively to the European market. A cost-effective Receipt and Ticket printer ideal for Retail, Hospitality and Banking applications. Sporting a compact, ergonomic design, the SRP-E300 can be used as a stand-alone printer or wall-mounted for extra space saving opportunities. Printing at speeds up to 220mm/sec and offering a print resolution of 180dpi (SRP-E300) or 203dpi (SRP-E302) to produce high quality graphics, text and barcodes. Alongside a highly reliable mechanism supporting 150km TPH and a 1.5 million cuts Auto Cutter. The SRP-E300 boasts a range of cost-effective features including an economical USB only version or BIXOLON’s All in one Plus™ Interface including USB V2.0 FS + Ethernet + Serial. Alongside a paper saving mode which can reduce the length of a receipt up to 25% while operating with energy star certification. The printer also comes with a 2 year warranty as standard.